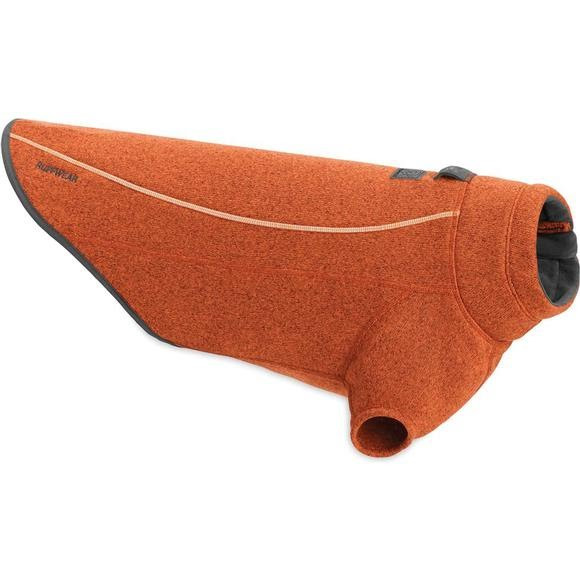 The Ruffwear Fernie is a technical sweater for dogs, designed for everyday adventures from the trail to town. Advanced sweater-knit fabric offers the look of a sweater with a fleece interior, offering the warmth and performance of a fleece jacket. This sweater can be worn alone, or layered underneath other Ruffwear coats for additional warmth. The Ruffwear Fernie is a technical sweater for dogs, designed for everyday adventures from the trail to town. Advanced sweater-knit fabric offers the look of a sweater with a fleece interior, offering the warmth and performance of a fleece jacket. This sweater can be worn alone, or layered underneath other Ruffwear coats for additional warmth. Our "Sleeved" style jacket provides full coverage for maximum warmth. A convenient zipper on the left side of the jacket allows for a high-performance fit.